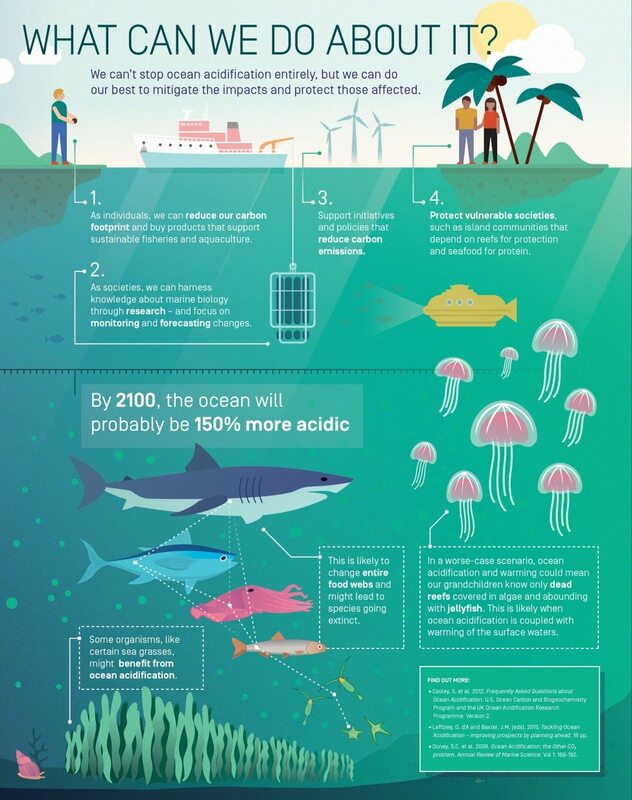 Ocean acidification, caused by the addition of huge amounts of carbon dioxide to the marine environment, is a problem that has come to the fore relatively recently. Jason Hall-Spencer, Professor of Marine Biology at Plymouth University, places it within the context of the myriad other threats that face the world’s oceans. Our use of finite natural resources is accelerating. Coupled with our poor management of renewable resources, this means that the earth has entered a phase of mass extinction; biodiversity is being lost across the planet. Since the 1950s, coastal ecosystems have been radically transformed by human activities. The oceans have fared no better. Within a generation, fishing vessels using fossil fuels have removed most large fish from ecosystems and caused continental shelf habitats to lose their diversity. Extensive damage is now also occurring all along the edges of continental shelves and even on remote sea mounts. The good news is that governments are at last getting serious about cutting carbon dioxide (CO2) emissions and enforcing restrictions on destructive practices. The past 60 years have without doubt seen the most profound transformation of our relationship with the natural world in the history of humankind. Since 1950, the human population has trebled (now at 7.3 billion, it is still rising fast); water use is up from 1,800 to 5,800 cubic kilometres per year; the number of rivers dammed has risen from 4,000 to 28,000; fertiliser consumption has jumped from 40 million to 280 million tonnes a year, quadrupling inputs of nitrogen to the coastal zone; and 65% of the atmospheric ozone has been lost. Motor vehicle use is up from 30 million to 750 million vehicles on the road and international tourism has really boomed, rising from fewer than one million arrivals per year in the 1950s to 600 million today. All this has led to a great acceleration in our use of the earth’s resources. Atmospheric methane and CO2 concentrations have increased, causing the temperature of surface sea water to rise. We know from ice-core data that these warming gases are at much higher levels than at any time in the past 800,000 years, an era that includes a sequence of glacial periods and warm periods. Now we have entered unknown territory, as the excess CO2 in the atmosphere is acidifying the oceans. The monitoring of surface sea water off Hawaii and on both sides of the North Atlantic clearly shows increases in CO2 levels that are tracking atmospheric increases. 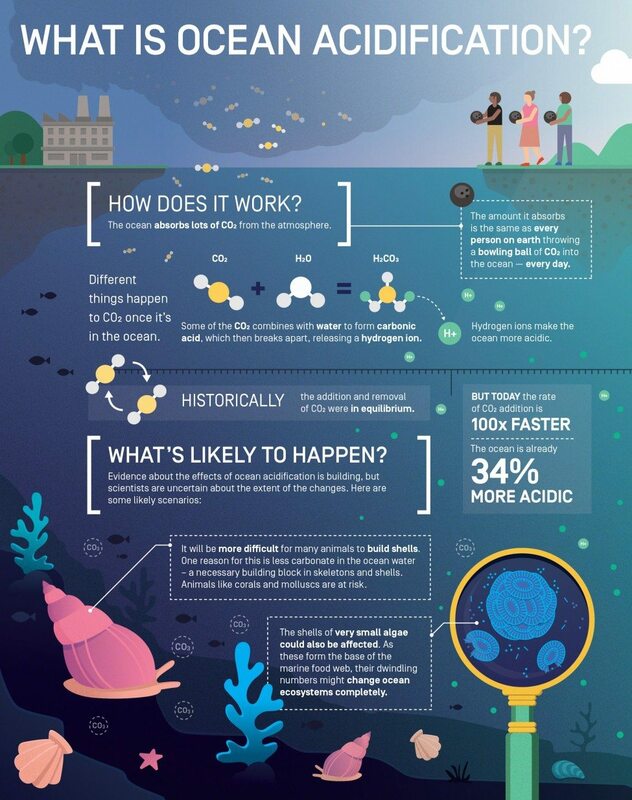 Carbon dioxide forms carbonic acid when it dissolves in water and has caused a 34% increase in the acidity (i.e., the concentration of hydrogen ions, H+) of sea water since 1800; by 2100 it will have caused an increase of about a 150% in surface ocean acidity. This is the fastest rate of chemical ocean change for millions of years, and perhaps in all time, since the rate at which fossil fuels are being burnt is geologically unique. In effect, the amount of carbon taken up by the oceans at present equates to every person on earth throwing carbon of the weight of a bowling ball into the sea every day. Clearly ocean acidification is not acting in isolation. Rising CO2 levels are also causing ocean warming, which is damaging tropical coral reefs, melting Arctic ice, thawing tundra and causing the distributions of many marine species to shift towards the poles. In low-latitude areas, warming waters are causing oxygen depletion, as warm water can’t hold as much oxygen as cold water can. Also at low latitudes, mid-ocean gyres with low productivity are expanding because increased thermal stratification suppresses mixing and so starves surface waters of the nutrients that underpin productivity in the food web. Research into ocean acidification is the ‘new kid on the block’ among planetary environmental issues. As evidence rolls in from across the globe it is becoming clear that many organisms are likely to be affected because not only does ocean acidification increase the amount of carbon available for photosynthesis and so is a resource for primary production, but it also lowers the amount of carbonate in the water, so that it can become corrosive to exposed skeletons and shells. The acidification of the oceans has myriad biological ramifications because the transport of materials across cell membranes is influenced by H+ concentrations and so this can affect reproduction, behaviour, respiration and growth. This is thought to explain why the fossil shells found after high-CO2 mass extinctions are dwarf forms, since smaller animals are better able to cope with the stress of ocean acidification. One of the earliest studies of the biological effects of ocean acidification was carried out in aquaria in which corals switched from calcification to dissolution as CO2 levels rose. This study was followed by a slew of high-profile papers pointing out that unless we get a grip on CO2 emissions, tropical coral reefs will disappear. As I specialise in temperate systems, this work on tropical coral reefs set me wondering about what ocean acidification might do to the organisms that live off Plymouth in south-western England and the corals that form deep north-east Atlantic reefs. One way to approach this question is to visit places that resemble what we expect the future to be like. A comparison of coral reefs of the Bahamas with those off Panama shows, for example, that coral reefs begin to crumble as carbonate saturation states fall. So today we find robust reefs in the Caribbean but eroded reefs in the low-carbonate waters of the tropical East Pacific. Studying places that already experience the lower carbonate conditions of a high-CO2 world enables us to find out about the ecological effects of ocean acidification. Research has begun in coastal areas that are acidified by CO2, showing which organisms thrive and which are most vulnerable. This approach augments laboratory work, which is usually short-term and concentrates on organisms that are isolated from competitors, parasites and grazers. Volcanic activity causes CO2 to bubble up from the sea floor, acidifying large areas for hundreds of years. It’s tricky to find areas without the confounding effects of sulphur or toxic metals, but it can be done. We have discovered that chronic exposure to increases in CO2 around volcanic seeps alters food webs and causes the loss of marine biodiversity in the Mediterranean Sea, the Gulf of California and off Papua New Guinea. Key groups, like sea urchins and coralline algae, are consistently compromised and fish reproduction is disrupted. It is not all doom and gloom, however; higher CO2 levels stimulate the growth of certain diatoms, macro-algae and sea grasses. If temperatures remain low enough, the symbiotic algae of corals and anemones do well, as do numerous invasive species of seaweed. Some organisms adapt to long-term acidification, and species with protective tissues – including some corals in the tropics and mussels in temperate areas – often tolerate acidified sea water. Unfortunately, the combination of acidification and rising temperatures is often deadly, as the fall in carbonate saturation causes coral skeletons to dissolve and increased CO2 levels stimulate the growth of fleshy algae that smother reefs. As evidence about the effects of ocean acidification has started to build up we can begin to speculate about what our oceans may look like in coming decades if we do not get a grip on CO2 emissions. It seems highly likely that iconic coral reefs will be a shadow of their former glory, with far fewer coral species and consequently a much lower diversity of many other organisms, from noisy nocturnal shrimps to colourful shoals of fish. Carbon dioxide emissions will continue to warm the ocean’s surface, repeatedly hitting reef systems with the stress of bleaching and spreading coral disease. This means that our grandchildren will probably only know dead reef rock covered in turf algae – and they’d better watch out, since soft-bodied jellyfish thrive in acidified waters. The few surviving coral reefs off Florida, for example, are likely to be lost in a vicious circle of coral decline and increased storminess that causes the breakdown of coral habitat through erosion and run-off from land. Even deep-water coral reefs, although far from coastal impacts, are unlikely to escape widespread damage, since rising CO2 levels are expected to eat away at the reef structure. 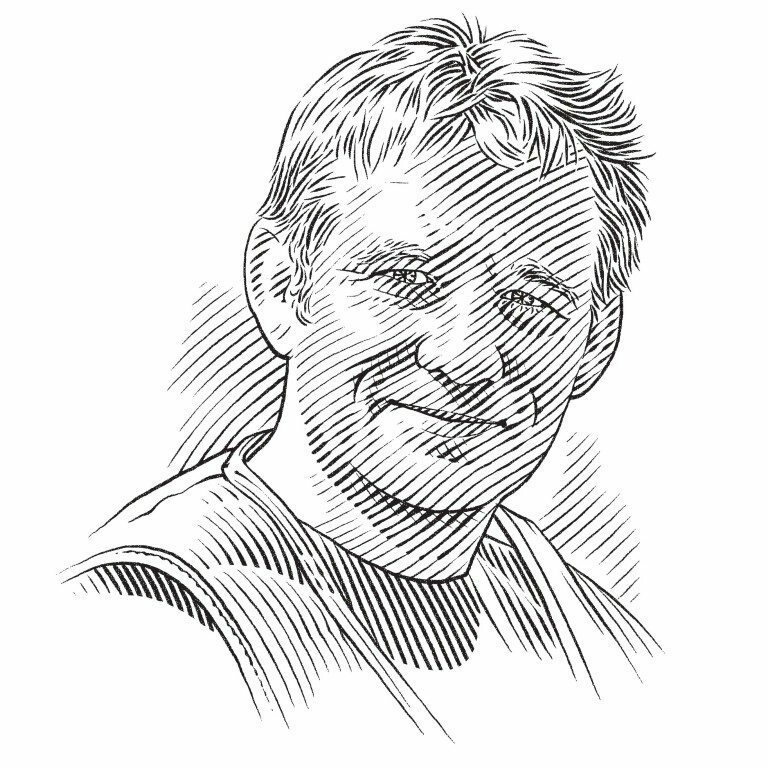 Perhaps most people will be oblivious to these changes, just as only those who watch old Cousteau films are struck by the loss of large fish at sites the world over. As a tourist in New Zealand, I was blissfully ignorant of the local conservation situation – until local biologists explained to me how invasive species had ravaged the terrestrial flora and fauna. It’s a bit like this when I take journalists to see areas with very high CO2 levels near underwater volcanoes. They are often struck by how much life there is within the wafting sea grasses and seaweeds. It’s not until we swim out of an acidified zone that they notice what was missing. The dappled greens and browns of the acidified waters are pretty enough, but nothing compared to the riot of colour that meets the eye at present-day CO2 levels in gardens of pink encrusting algae, rasping purple sea urchins and bright yellow coral polyps. 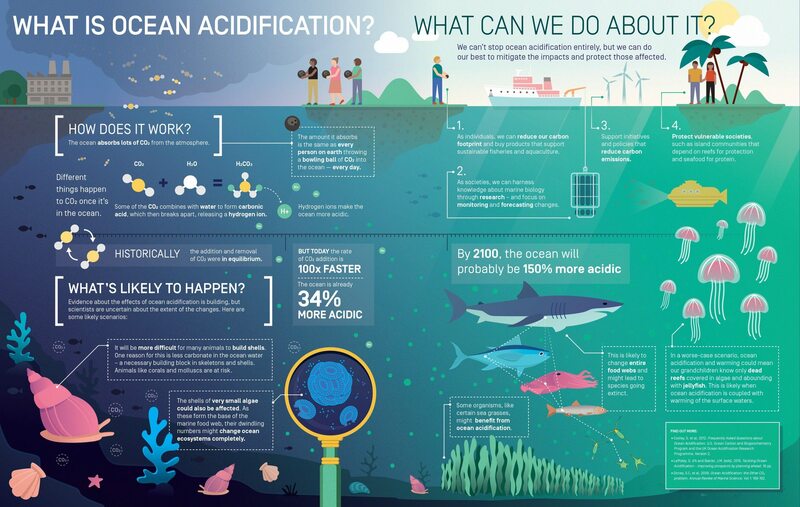 What can we do about Ocean Acidification? Even though human activities in the oceans and coastal zones continue to increase, we already have the know-how to ensure that marine environments are protected and managed sustainably. For a long time the oceans were to most people ‘out of sight and out of mind’, but in the information age it is ever easier to communicate solutions to the problems faced by our blue planet. Now that the science is better informed about practices that are clearly destructive and about the effects of rising CO2 levels, we can focus on decisive avenues for action that will make a difference. As individuals, we can reduce our carbon footprint and buy products that support sustainable fisheries and aquaculture. As societies, we can harness knowledge about marine biology to help improve the political, legal and institutional frameworks that focus on reducing CO2 emissions and to showcase success stories in better marine governance. We are beginning to see a shift in the way coastal zones are managed, since we now need to factor in the effects of increased CO2 levels on sea level, storminess, heat waves and acidification. To stand a chance of protecting coral reefs and other iconic marine habitats, we need to integrate better the challenges associated with climate change and at the same time rein in the most obviously damaging activities, like the extermination of large marine organisms, the fuel-thirsty trawling or mining of the seabed and the pollution of coastal habitats.